Alexander Jurikas was the eldest brother of my grandmother Marija whose story appeared here 27 November 2007. 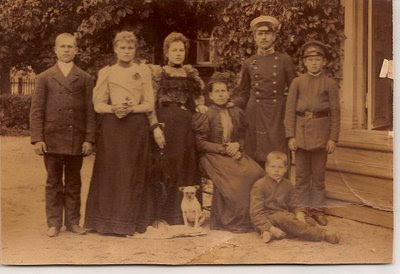 He was born at Krumini farm, Lade parish, Limbazi, Latvia about 1871, son of Janis Jurikas and Katrina Tukums. His baptism does not appear in the Limbazi-Lemsal parish register. He died about 1927, reportedly in Astrakhan in the U.S.S.R. The name of his wife is unknown. This family was able to educate their children well, despite mother Katrina’s early widowhood. Alexander was about 18 when his father died in 1885. The four boys attended Russian-style academies. In this photo, probably dated in the early 1890s, Alexander wears a uniform of undetermined origin. It’s not difficult to see that Sasha was on a reform bent. Family stories say that he lost his faith in the revolutionary proceedings as they turned communist. Eventually, it was said, he gave up the priesthood to become a newspaper writer and editor in Astrakhan. It’s impossible to imagine the despair and/or circumstances that contributed to taking his own life by strychnine poisoning. Of his three children, the two sons became medical doctors. Daughter Olga became a librarian for the Leningrad Philharmonia, last known to be retired in St Petersburg in 1973. Family contact has been lost. In February of 1998, the president of APG notified us of our official chapter status. From the group I initially called together two years previously, OCAPG joined the worldwide organization that now numbers well over 2,000 members. Our founding members on the application were myself, Sharon Murphy, Barbara Samson-Willis, Louise St Denis and Jeff Stewart. What are professional genealogists and what do they do? The answer is almost as varied as the individuals and like many professions has specialties within the field. Genealogical research is the bedrock of our profession whether we work as independent business contractors, for commercial companies, for genealogical societies, libraries, publishers or family organizations. Some of the specialty research areas are heir searching, adoption, DNA and genetics, teaching and writing, lineage society applications and ethnic or geographic concentrations. Some members like to apply their expertise to website design, translation of documents, arranging and leading overseas homeland tours, photography of ancestral sites or the indexing of original records. Mutual goals are outlined in the APG Code of Ethics: www.apgen.org. The APG mail list, one of the most active genealogy listserves on the Internet, reflects the international nature of our membership and helps provide unique insight to resources not possible ten years ago. The word professional applies not only to those who undertake work for clients. Serious family historian members approach their work with the same dedication to careful scholarship and source citation. As the first chapter in Canada, OCAPG has seen changes and advancements over the past years. We have expanded our membership to more than 50. Not all can attend regular meetings in Toronto—our chapter mail list exists to stimulate news, information and assistance. Early days saw members who recognized a need and branched out to create the groundbreaking project called APOLROD (Association for the Preservation of Ontario Land Registry Office Documents) and the online National Institute for Genealogical Studies. We’ve had excellent committees to work on our workshops, seminar events and the essay contest. At the annual conference of the Ontario Genealogical Society, we plan special activities: “Ask A Professional” has been a popular venue for free research consultations. And ... like all genealogical groups ... we have cycles in the numbers of volunteers we can call on. Why am I writing about this? Because the chapter seems to occupy quite a bit of my time. Because the more experienced among us can mentor the newer members. Because we need to encourage self-directed education and support and yes, even socializing. Because I appreciate the time a handful of people invest for the greater good of the membership and the profession. Because we know the value of family history and its sources and must fight, sometimes, for gaining or maintaining access to historical census returns and vital records. 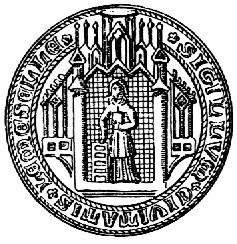 Because some day we will see university degree programs in genealogy and family history studies. It’s coming. My recent travels were yet again to another Middle Eastern country ... or so some travel agents categorize Egypt, although it is in North Africa. 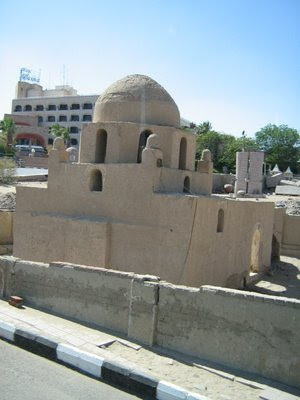 This photo is of an Islamic cemetery in Luxor, with a typical family tomb in the foreground. It is probably made of “mud bricks.” We did not have an opportunity to actually visit a cemetery as package tourist itineraries are set in stone and lingering on the street could mean your bus disappears. A guard armed with an unobtrusive machine gun is now mandatory protection on tourist buses. Cairo has a similar immense cemetery. In 1961 I saw families here and there in the Necropolis, paying extended visits to deceased relatives, comfortably ensconced with their cooking fires and pots. Today, over a million homeless Cairenes randomly inhabit every nook and cranny of the Necropolis tombs. Tour guides are very often students supplementing their income for a post-grad degree. They usually have encyclopaedic knowledge of their country’s history and monuments. 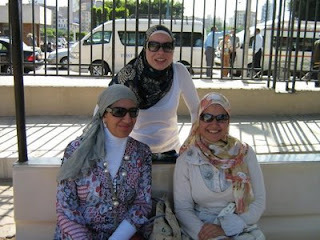 Several of our local guides were Moslem women whose daily appearance in colourful garments could almost convince one to wear the hijab. They were lively, interesting and competent women who love their work (we also had young men in blue jeans and designer glasses). Later in Jordan we had Nadine the “unorthodox” Moslem woman. Nadine was outspoken and wore sweatshirts and no hijab. No public judgment is attached to her choices, which she didn’t mind explaining to us from the Quran/Koran. Our western countries are not the only ones to claim cultural tolerance and the flexibility to interpret religious writings. On the other hand, one day at Giza, as crowds of tourists filed patiently along the street, the imam’s broadcast at the noon call to prayers was an endless, furious harangue. Our guide was embarrassed to translate. He was angrily calling on the faithful to reject the non-Moslem world. We all have our fanatics. I do digress from cemeteries, don’t I. It’s an education, an invitation, to try to understand the greater part of the world outside North America. Remembrance Day in Canada 2008 marks the 90th anniversary of the ceasefire on the Western Front in Europe. Armistice Day 11 November 1918 marked the finish of “The War to End All Wars.”Apparently we were doomed to repeat history. On that day in a German prisoner-of-war camp in Holzminden, Lower Saxony, captured British and Colonial officers were already aware of deteriorating morale among the camp guards and some disarray in the German army. Rumours had been flying of impending German surrender and peace. But prison life was generally consumed with getting enough to eat and how to escape. Escape was considered a duty and was never far from prisoners’ thoughts. One of the most famous and daring escapes of the war occurred in the summer of 1918 at this camp, later chronicled in The Holzminden Tunnellers by an eyewitness. On 11 November 1918 in Holzminden, the rumours of Armistice had come true but it was not instant freedom for the prisoners. It would be another month before the men were entrained for “old Blighty.” During the long, anxious waiting period, the great political, military and social turmoil in Germany was evident. The hated, harsh camp commandant Niemeyer himself had seldom been seen lately. Later they heard he had slipped away in civilian clothes. Some prisoners were able to move surreptitiously back and forth to the town, on the lookout for “grub” and hoping to see their own troops arrive. But prudently, most prisoners decided their chances of getting shot were high if they tried to “hoof it” away through the countryside. On 11 November 1918, where was my father? Let’s be accurate and say the man who would become my father. He was in the Holzminden camp, hungry and impatient like all the others. 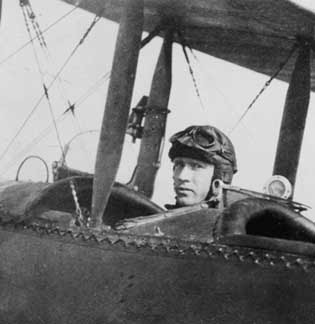 Lt. Hector Fraser Dougall from Winnipeg was a Royal Flying Corps pilot in 54 Squadron who was shot down behind enemy lines in France, in February of 1918. In a satisfying act of defiance — remembering the lack of adequate medical treatment, the withholding of Red Cross parcels, the consignments to solitary punishment for his many escape attempts — he climbed to the top of the main camp building and “liberated” the camp’s enormous state flag. The Globe and Mail photograph. Hector kept a secret (forbidden) diary during his capture time. He was marked as a “difficult prisoner” with a history of escaping while being shuffled from one prison to another. I mention only two of many escape attempts that have been reconstructed by oblique diary references and later information from fellow prisoners. His final routing was to the supposedly top-security Holzminden. Despite the heavy complement of guards, he and another man jumped from the train along the way. This particular escape attempt lasted over two weeks’ time and came heartbreakingly close to success. When German soldiers caught them and were about to fire on his companion, Hector deflected their attention, allowing companion Williams to make good his escape. Hector’s fate was solitary confinement at Holzminden. Sedley Williams’ subsequent letter from England to Hector’s family expressed his enormous gratitude and described their adventures in great detail. Fellow airman from Winnipeg, William Stephenson (much later known as Intrepid), also joined the Holzminden gang by September of 1918. In mid-October he and Hector were two who set off on “a hike to the frontier.” Stephenson did reach Allied lines but Hector was recaptured, to be thrown into solitary once again with the threat of court martial. During a family visit in 1981, Sir William admitted that his successful escape to British lines was due to the diversion Hector created among the guards hunting them down. “They called out the Fire Department to put it out, and we cut their hoses to pieces. Everything smashed to pieces in the camp. Got beautifully drunk myself. So did most of the boys.” Family photograph. and a very special DVD created in the 21st century by Hector Fraser Dougall II that followed father Hector's 1918 diary route through France and Germany, visiting prison sites ... some of which the current residents were no longer aware.